From Anthony May: If you are looking for a great conversation to listen to for the commute home, YOU MUST check out this podcast! 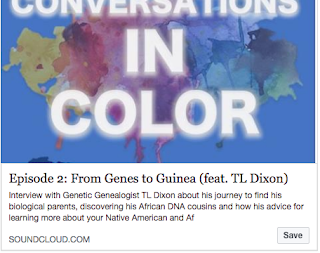 I had the pleasure this weekend of interviewing my cousin TL Dixon, a genetic genealogist, about his search for his biological parents, connecting to cousins in Africa, and advice for sorting out your African and Native American DNA. You can check it out through Soundcloud here or at Anthony May's website at www.nketa.org/#Podcats.